Not one can tell you what is right." Vibegirl Productions announces the premiere of its latest film, ANNA FREUD, Under Analysis. Produced entirely in Austin and featuring local Austin scholars and actors, this documentary chronicles the life story of the youngest child of Sigmund and Martha Freud - her childhood in "the most anti-Semitic city in the world," her analysis by her own father, her prominence in the creation and development of child psychology, the love of her life - Dorothy Tiffany Burlingame, daughter of Louis Comfort Tiffany - and finally her death in 1982. 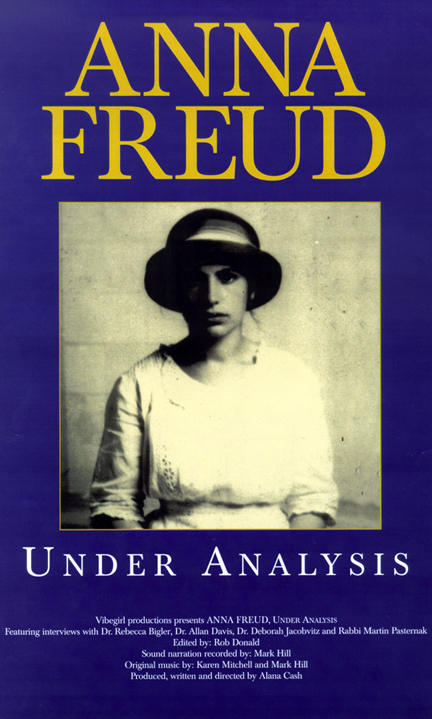 ANNA FREUD, Under Analysis - the dramatic story of Sigmund Freud's youngest, and least-wanted child, who happened to be the one who inherited the Freud legacy and used her own unhappy childhood to develop the field of child psychoanalysis. Anna Freud conceived the child development profile, and along with her life partner, Dorothy Tiffany Burlingame, generated the concept of indexing psychoanalytic cases. Because she understood so well the relationship between child and primary caretaker, Anna Freud was instrumental in the best-interests-of-the-child legal movement of the 1970s. Rabbi Martin Pasternak of Dell Jewish Community Center, speaking about Jewish history, the Blood Libel and the Holocaust. Dr. Allan Davis, psychoanalyst, tells about the history of psychoanalysis and Anna Freud's accomplishments in the field of child psychoanalysis. Dr. Rebecca Bigler and Dr. Deborah Jacobvitz, two university instructors, address Anna Freud's life from the current perspective of child development. ANNA FREUD, Under Analysis is the third documentary produced by native Texan, Alana Cash. Cash began her film career in Los Angeles working for Universal Studios who assigned her to Lucasfilm. From there she moved to New World Pictures and then on to the Irving Paul Lazar Literary Agency. Returning to Texas, Cash began to teach creative writing. Many of her students published and won awards and Cash was one of 60 teachers in the U.S. chosen to be profiled on the PBS series on expository writing. ANNA FREUD, Under Analysis, is Cash's third documentary film. Her first film, MILEVA MARIC, the Other Einstein, chronicles the life of Albert Einstein's first wife and the contributions she made to the theories that made him famous. Her second documentary was on the private life of Marie Curie, who achieved great fame as a scientist and almost lost her second Nobel Prize because of her affair with a married colleague.